Mercedes-Benz has held a live online reveal event dedicated to its facelifted GLC SUV coupe. The car has gone through a series of exterior design tweaks, gained new features, and will ship with an overhauled selection of engines. So far, we have been shown the “sported-up” AMG Line version of the vehicle. It comes with more aggressive-looking front and rear bumpers and a dot-patterned radiator grille. In its base trim, both the AMG and the non-AMG car ship with regular LED-based headlights, but you can also opt for matrix LED headlights. The interior now houses a steering wheel with sensor controls, a digital dashboard (option), an MBUX multimedia system with voice and gesture control, and a 7” touchscreen display (option: 10.25”). The infotainment system now offers the innovative feature called Energizing, which simultaneously controls interior lighting, music volume, air temperature, and seat functions (massage/heating/ventilation) to improve the mood of the driver and passengers and help them relax. As for the engines, the old M274 2.0-liter gas engine is no longer available. It gets replaced by the new M264, which offers the same displacement volume along with advanced valve timing and a turbocharger. 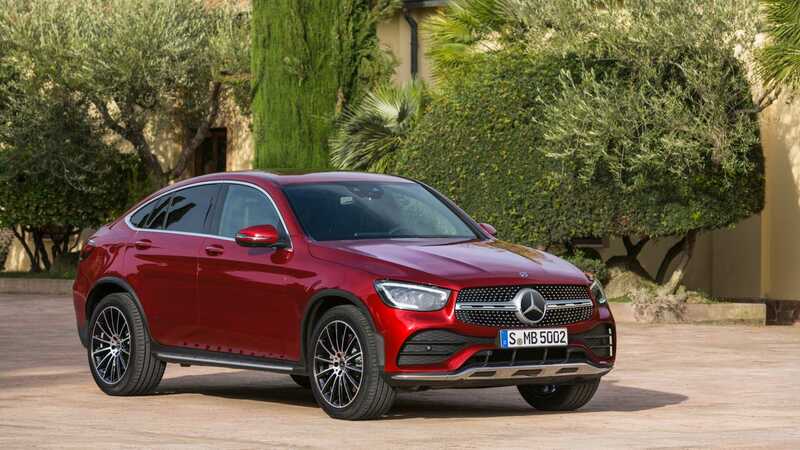 In the GLC 200 Coupe version, it comes rated at 197 hp / 147 kW, while the higher GLC 300 Coupe trim gets the same engine boosted to 258 hp (192 kW). Both variants ship with a hybrid add-on consisting of a starter-generator and a 48V on-board power circuit. The starter-generator contributes 14 hp (10 kW) of its own and enhances acceleration. The old OM651 diesel engine is not on the offer, either. This one gets phased out by a more modern design called the OM654, available in three variants: 163 hp / 122 kW (GLC 200 d Coupe), 194 hp / 145 kW (GLC 220 d Coupe), and 245 hp / 183 kW (GLC 300 d Coupe). None of the three is hybrid. Regardless of your chosen configuration, the Mercedes-Benz GLC Coupe always ships with a nine-speed automatic transmission and AWD. Available suspension types include spring-based, adaptive and air. Other editions of the SUV coupe will become available later, including the AMG performance version. Mercedes-Benz will ship the GLC Coupe simultaneously with its non-coupe counterpart in the summer of 2019.